Microsoft Cloud App Security can integrate with existing DLP solutions to extend these controls to the cloud while preserving a consistent and unified policy across on-premises and cloud activities. The platform exports easy-to-use interfaces including REST API and ICAP, enabling integration with content classification systems such as Symantec Data Loss Prevention (formerly Vontu Data Loss Prevention) or Forcepoint DLP. Integration is accomplished by using the standard ICAP protocol, an http-like protocol described in RFC 3507. 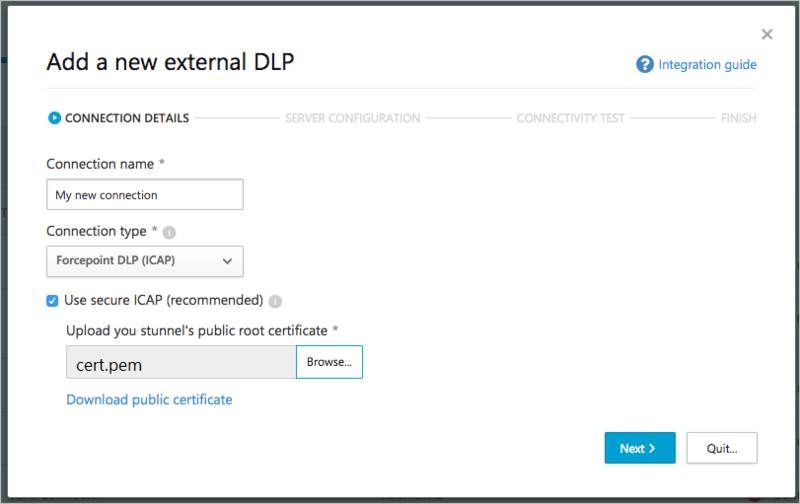 To secure ICAP for transmission of your data, it's required to set up a secure SSL tunnel (stunnel) between your DLP solution and Cloud App Security. The stunnel setup provides TLS encryption functionality to your data as it travels between your DLP server and Cloud App Security. This guide provides the steps necessary for configuring the ICAP connection in Cloud App Security and the stunnel setup to secure communication through it. Cloud App Security scans your cloud environment and based on your file policy configuration, decides whether to scan the file using the internal DLP engine or the external DLP. If external DLP scan is applied, the file is sent over the secure tunnel to the customer environment where it's relayed to the ICAP appliance for the DLP verdict: allowed/blocked. Responses are sent back to Cloud App Security over the stunnel where it's used by the policy to determine subsequent actions such as notifications, quarantine, and sharing control. Since Cloud App Security runs in Azure, a deployment in Azure yields improved performance. However, other options including other Clouds and On-Premises deployment are supported. Deploying in other environments may result in degraded performance due to higher latency and lower throughput. The ICAP server and stunnel must be deployed together on the same network to make sure the traffic is encrypted. In order for Cloud App Security to send data through your stunnel to your ICAP server, open your DMZ firewall to the external IP addresses used by Cloud App Security with a dynamic source port number. By default the stunnel port number is set to 11344. You can change it to another port if necessary, but be sure to make note of the new port number - you will be required to enter it in the next step. 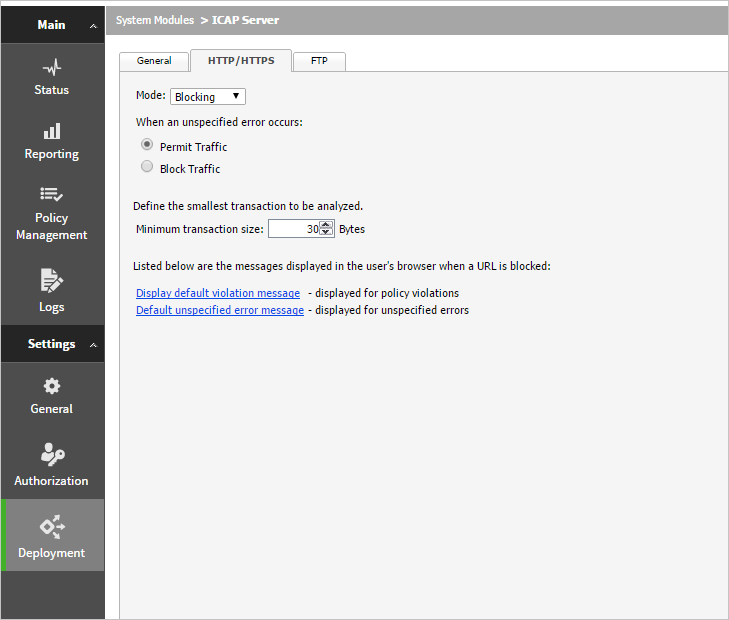 Set up an ICAP server, taking note of the port number, and make sure that you set Mode to Blocking. Blocking mode sets the ICAP server to relay the classification verdict back to Cloud App Security. Refer to your External DLP product documentation for instructions on how to accomplish this setup. As an example, see Appendix A: Forcepoint ICAP server setup and Appendix B: Symantec Deployment Guide. In this step, you set up the stunnel connected to your ICAP server. While highly recommended, this step is optional and can be skipped on test workloads. A server - either a Windows Server or a Linux server based on a major distribution. Refer to the stunnel website for details about the types of servers that support stunnel installation. If you're using Linux, you can use your Linux distribution manager to install it. During installation, don't create a new self-signed certificate. You'll create a certificate in a later step. Click Start server after installation. 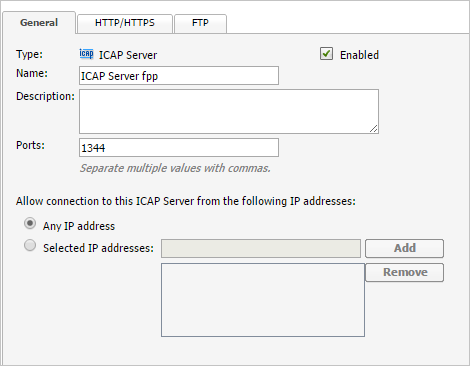 Use your certificate management server to create an SSL certificate on your ICAP server. Then copy the keys to the server you prepared for the stunnel installation. Download the public key and save it in this location C:\Program Files (x86)\stunnel\config\MCASca.pem. Run: c:\Program Files (x86)\stunnel\bin\stunnel.exe to open the stunnel application. Click Configuration and then Edit configuration. Save the file and then click Reload configuration. The following example is based on an Ubuntu server installation, when signed in as root user - for other servers use parallel commands. The ICAP server and Cloud App Security use a private key and public certificate for server encryption and authentication across the stunnel. Make sure you create the private key without a pass phrase so that stunnel can run as a background service. Also, set the permission on the files to readable for the stunnel owner and to none for everyone else. The stunnel configuration is set in the stunnel.conf file. Make sure that the network in which the stunnel server was deployed matches the network prerequisites as mentioned earlier. This is required to allow incoming connections from Cloud App Security to successfully reach the server. If the process is still not running, refer to the stunnel documentation to troubleshoot. In Cloud App Security, under Settings select Security extensions and select the External DLP tab. Click on the plus to add a new connection. In the Add new external DLP wizard, provide a Connection name (for example My Forcepoint connector) that will be used to identify the connector. 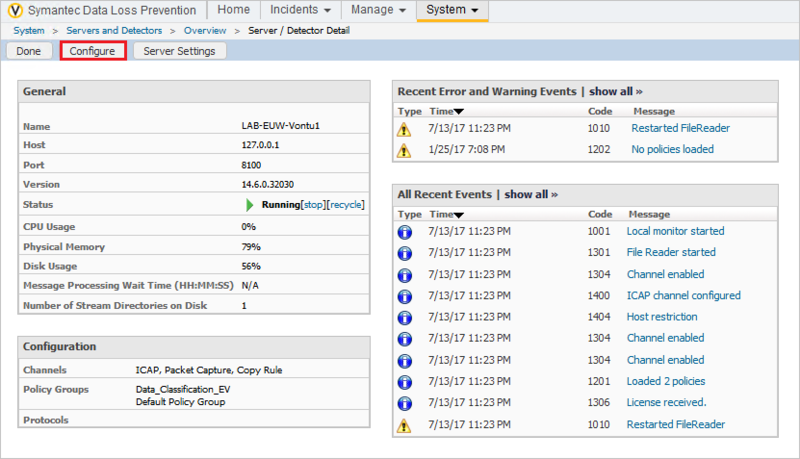 Symantec Vontu – Use the customized integration for Vontu DLP appliances. 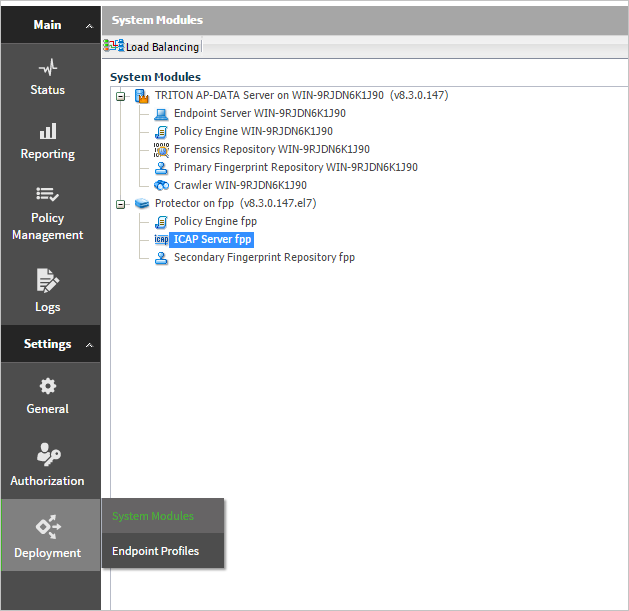 Forcepoint DLP – Use the customized integration for Forcepoint DLP appliances. 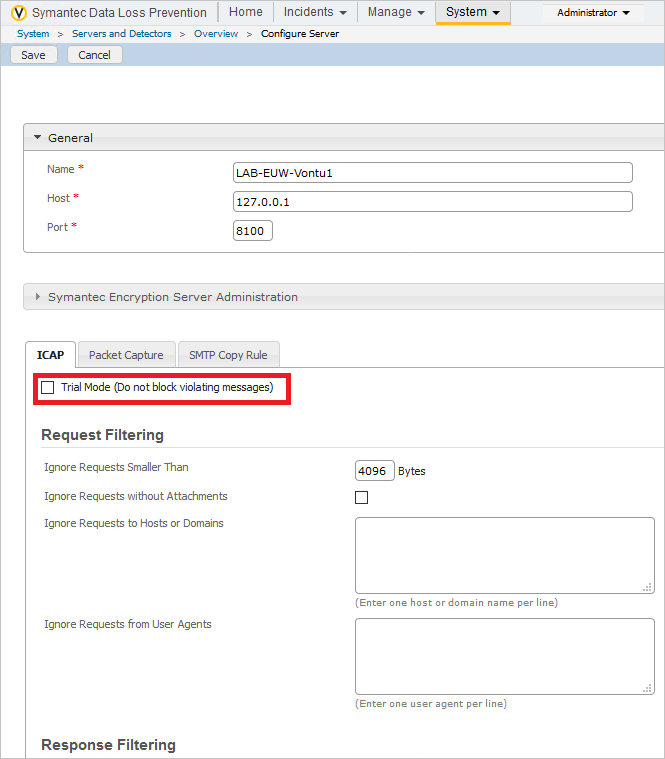 Generic ICAP – REQMOD - Use other DLP appliances that use Request Modification. Generic ICAP – RESPMOD - Use other DLP appliances that use Response Modification. Browse to select the public certificate you generated in the previous steps, “cert.pem”, to connect to your stunnel. Click Next. It is highly recommended to check the Use secure ICAP box to set up an encrypted stunnel gateway. If, for testing purposes or if you don't have an stunnel server, you can uncheck this box to integrate directly with your DLP server. In the Server configuration screen, provide the IP address and Port of the stunnel server that you set up in Step 2. For load-balancing purposes, you can configure the IP address and Port of an additional server. The provided IP addresses should be the external static IP addresses of your servers. Click Next. Cloud App Security tests connectivity to the server you configured. If you receive an error, review the instructions and network settings. After it's successfully connected, you can click Quit. 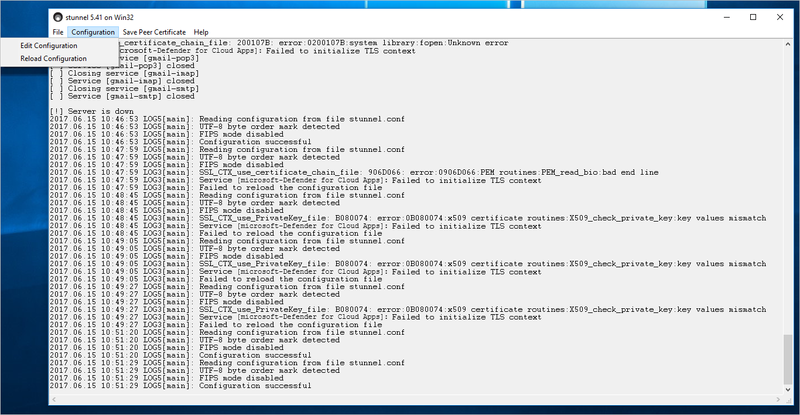 Now, to direct traffic to this external DLP server, when you create a File policy under Content inspection method, select the connection you created. Read more about creating a File policy. 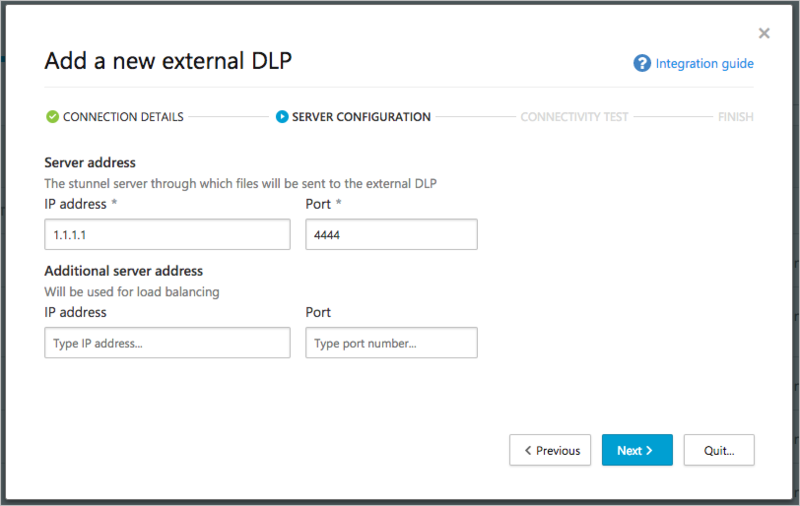 In your DLP appliance, go to Deployment > System Modules. In the General tab, make sure ICAP Server is Enabled and the default Port is set to 1344. Also, under Allow connection to this ICAP Server from the following IP addresses, select Any IP address. In the HTTP/HTTPS tab, make sure to set Mode to Blocking. The supported Symantec DLP versions are 11 and higher. As noted above, you should deploy a detection server in the same Azure datacenter where your Cloud App Security tenant resides. The detection server syncs with the enforce server through a dedicated IPSec tunnel. Under System > Servers and Detectors, click on the ICAP target. 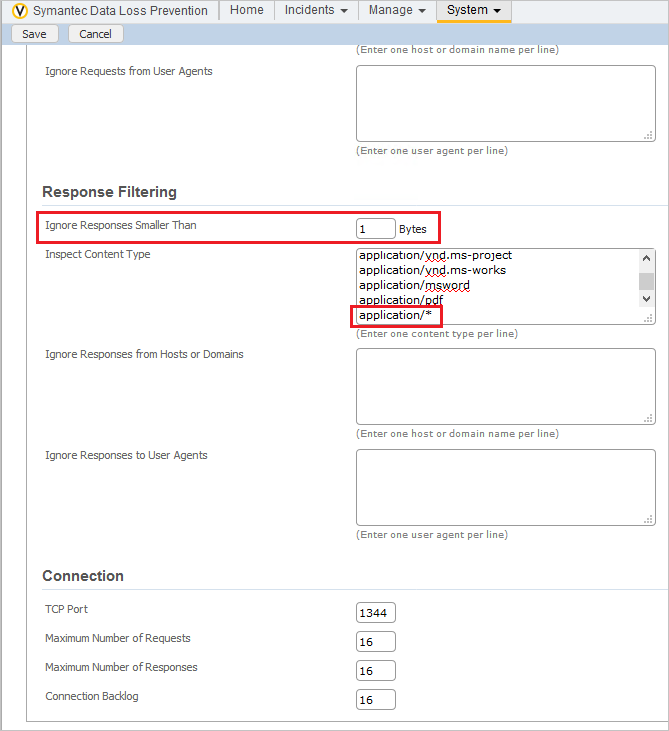 Under ICAP > Response Filtering, change the Ignore Responses Smaller Than value to 1. And add "application/*" to the list of Inspect Content Type. Cloud App Security seamlessly supports all detection rule types included with Symantec DLP, so there's no need to alter existing rules. However, there's a configuration change that must be applied to all existing and new policies to enable full integration. This change is the addition of a specific response rule to all policies. Go to Manage > Policies > Response Rules and click Add Response Rule. Make sure Automated Response is selected and click Next. Type a rule name, for example, Block HTTP/HTTPS. 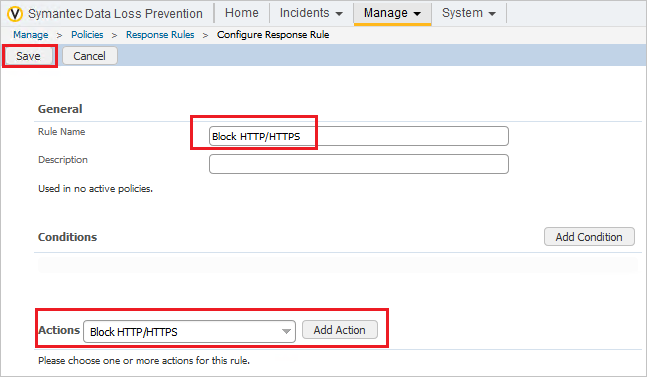 Under Actions, select Block HTTP/HTTPS and click Save. In each Policy, switch to the Response tab. From the Response rule dropdown, select the block response rule you created earlier. This rule must be added to all existing policies. If you use Symantec vontu to scan files from Dropbox, CAS automatically displays the file as originating from the following URL: http://misc/filename This placeholder url doesn’t actually lead anywhere but is used for logging purposes.